I firmly believe that the folks over at Capstone's PebbleGo are GENIUSES!! I am in love with their database for primary students, and I cannot even imagine my library program without it. I have been using their database for years. I introduce my kindergarten students to the program in the Spring when we study farm animals, and I reintroduce my first graders to the program in the Fall when we research Veterans Day. I have created single page research sheets to go along with each of PebbleGo's holiday pages ... NINETEEN in all!! Even first graders can read/listen to nonfiction text and cite evidence in a report-like form. It's the perfect introduction to research and notetaking! 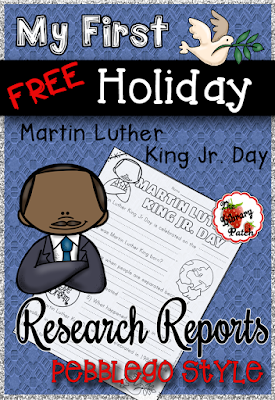 How about a little sneak peek at the report form and a freebie for Martin Luther King Jr Day?? You have to know that there is genuine value in having our younger students answer "simple and straightforward" types of questions. Finding textual evidence in a resource is a skill that needs to be practiced. It builds the foundation for deeper and more critical thinking. Go ahead and click on the picture above to download your free copy!